The Perdana Botanical Garden, formerly known as Taman Tasik Perdana or Lake Gardens, is situated in the Heritage Park of Kuala Lumpur. 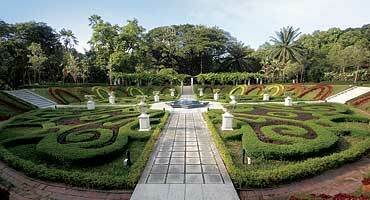 It has always been a part of the green lung of the city and has a history of over a decade. Originally created as part of a recreational park but planted with collections of tropical plants, the garden have been rehabilitated and turned into a Botanical Garden. The garden have not only botanical collections but also house features that give the visitors the ambiance of being in a tropical rainforest, despite being in the middle of a bustling metropolis. 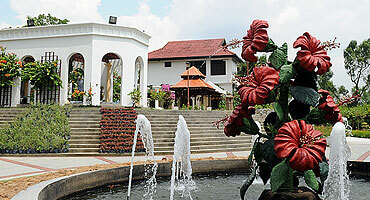 The Hibiscus Park showcases the various species of Malaysia’s national flower, the Bunga Raya (Hibiscus Rosa Sinensis). Some of the attractions in the garden include a 4-metre high waterfall, pools and fountains. A lovely colonial style building has been converted into an exhibition hall with a tearoom and a gallery. The Sunken Garden is a parterre garden made simply out of Acalypha siamensis, and Loropetalum chinense shrubs with addition of flowering annuals on the slopes. Addition of Grecian pots, containing a riot of colorful petunias add to the elegant beauty of the garden. 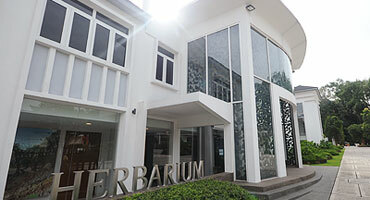 Herbarium Perdana Botanical Garden keeps the collections of flowering and fruiting plants from Perdana Botanical Garden and forest areas in Peninsular Malaysia. Herbarium is open to the public for studies of the plants from Monday to Friday, 8.00 am to 4.30 pm. In the middle of the main gardens, where the three main roads coming from the three entrances meet, there is a square where events and activities were carried out. It is a central area and located close to the boathouse and with ample space, it is a perfect area for gatherings. 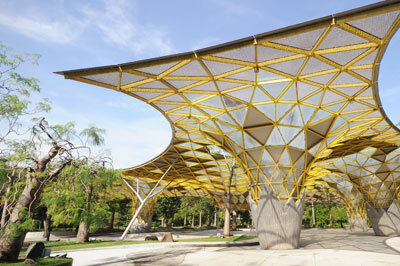 This is the Laman Perdana. © 2019 Kuala Lumpur City Hall. All Rights Reserved.